Your Next Economic Development Opportunity May be in the Clouds! The Affordable Care Act is an ambitious attempt to reform the entire healthcare industry, with its implementation taking place over time. Currently the law is to be gradually enforced beginning in 2010 and taking full effect in 2015. Starting in March of 2012 the reform will begin to require changes in the way that doctors collect data about their patients, culminating in the required use of an electronic health record system (EHRs). The implementation and maintenance of EHRs is likely to create high paying, stable jobs. The EHRs represent a unique economic development opportunity for communities to grow their healthcare and Information Technology (IT) industries. 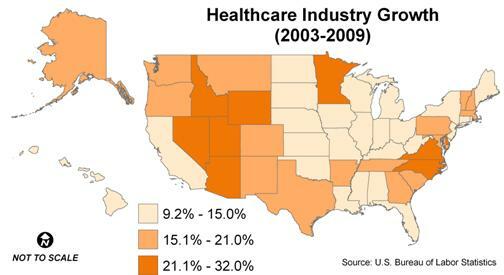 According to the Bureau of Labor Statistics, the healthcare industry employs over 17 million people across the country. Between 2008 and 2018 healthcare will generate 3.2 million new wage and salary jobs….more than any other industry. The government will provide a large portion of the money needed to implement EHRs, offering a maximum of $107,000 to individual doctor offices, with hospitals eligible for millions of dollars. The Affordable Care Act will begin requiring doctors to document specific information about their patients for data mining. The theory is that by understanding the current health disparities between races, ethnic groups, socioeconomic status and geographic regions will lead to better healthcare for everyone. Almost all EHRs will be one of two different types: web-based or client server. Web-based programs store client’s information on an off site server. Client server EHRs are stored on a local server within the doctor’s office. Web-based EHRs, using cloud-computing technology, Healthcare Industry Map would allow doctors and hospitals to view approved data for any patient from any other doctor across the nation. Patients will have control over whom they share their records with and will be able to instantly add any doctor that they choose. This access will allow doctors to see the complete history of their patient, even if the patient is new. Both systems have many infrastructure needs that will necessitate the hiring of new personnel to develop and maintain these systems. Each EHRs data center will require specialized construction, redundant power sources, cooling and security. This could include modification of an existing building or construction of a new building to house and run the data center. The nationally implemented EHRs system will require multiple large data centers to house all of the information. The government estimates that 212,000 jobs will be created by universally implementing EHRs. Most of these jobs will be focused on implementation, maintenance, development and security, and will require some form of IT education and training. Currently there is a shortage of qualified IT professionals to fill the positions needed today by current EHRs. As implementation of the national program begins to take effect, the shortage of IT professionals will only worsen. Communities and economic development organizations have the opportunity to expand their local healthcare and IT industries, but will need to work with their higher education institutions and local schools to ensure that they adapt and offer curriculum focused on this technology.